What has kindled the wrath of Poseidon? Something of his has been stolen, and he will destroy all of Atlantis to get it back. Join Ethan and Dallin, two brothers who are transported back to the ancient city, as they make new friends, attempt to outwit a corrupt magistrate, and seek to reunite an enslaved girl with her father. To do so, they must escape from a three-headed dog and his master, and battle a slithering thief from the Underworld. Will Ethan and Dallin discover that they possess what Poseidon wants before it is too late? 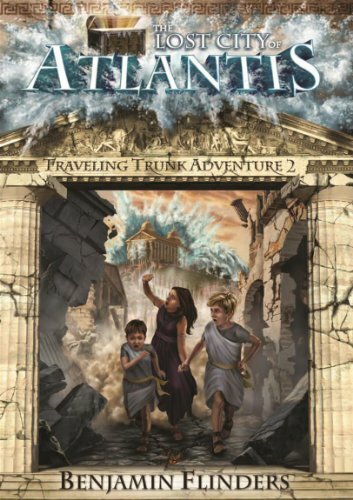 Or will they be lost forever with the ancient City of Atlantis? The second in a series of comical adventures scattered across history. From the New World to the Great Wall of China, the Traveling Trunk Adventures are sure to capture the imagination, free the spirit of adventure, and tickle the funny bone of every reader, young and old alike. Source: Received from author for review. Again, I'm always on the lookout for Middle Grade books that will capture the imagination. Especially if those books happen to target boys! Once again, completely smitten with this book! If you'll remember, I recently reviewed the first book in the series and loved that one as well. Without a doubt, the best part about these books is the imagination that shines off the pages. When I was younger, my favorite thing to do was pretend. Ethan and Dallin allow the reader to do that and present them the opportunity to learn new facts at the same time. Amazing! On that note, I feel the need to say that Ethan and Dallin are still two of the most precocious and enjoyable male protagonists I've had the pleasure to meet in a Middle Grade book. Quick witted boys who constantly throw out puns, they are so much fun to follow! I absolutely adored watching them tackle the crazy adventures and characters who crossed their path. If your children are stuck in the phase where learning is boring, treat them to this book. They'll come away happy and with new information! The Lost City of Atlantis (TTA #2) further cements in my mind that this is a fabulous series of books. A perfect combination of silliness, facts, and fiction, these books are perfectly written for the age group they are aimed at. I recommend these to the young, the young at heart, and anyone who happens to fall in between those two categories!